A number of evangelical leaders visited the Oval Office on Tuesday to pray for and with President Trump, reports CNN. As Pastor Rodney Howard-Browne of Florida led the prayer, some in the group placed their hands on Trump's back while others in attendance, including Vice President Mike Pence, bowed their heads. An image of the gathering was posted to the Facebook page of Pastor Howard-Browne and his wife Adonica on Wednesday. It read, "Yesterday was very surreal...30 years ago we came from South Africa to America as missionaries. 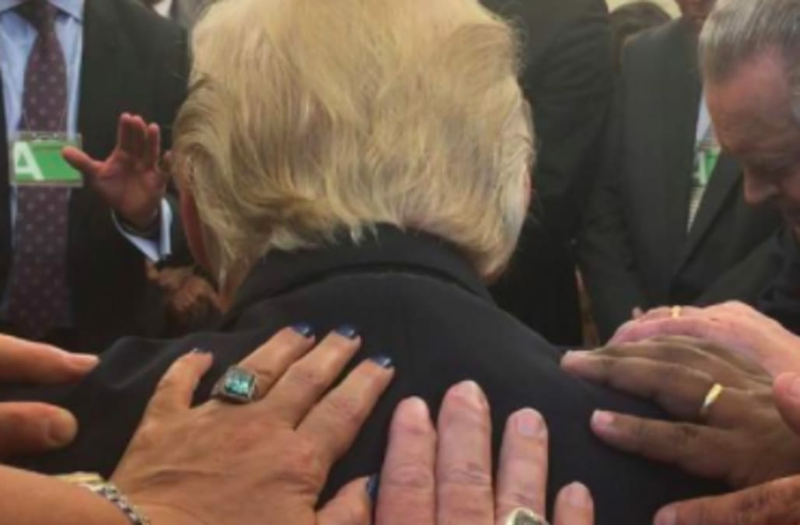 Yesterday I was asked by Pastor Paula White-Cain to pray over our 45th President – what a humbling moment standing in the Oval Office – laying hands and praying for our President – Supernatural Wisdom, Guidance and Protection – who could ever even imagine – wow – we are going to see another great spiritual awakening." Notably, white evangelicals overwhelmingly put their support behind Trump in the 2016 election. CNN notes that "Trump, according to Pew Research, won 81 percent of white evangelical voters..."
The Washington Post reports that in total, the group accounts for about one-fifth of registered voters nationwide.